Germany’s biggest lender is launching a mega rights issue and placing shares with a Qatari sheikh. The mix is messy but the quantum should silence Deutsche’s capital sceptics. And it’s clear the firm is making a big bet on investment banking in the wake of Barclays’ retreat. Anshu Jain (R) and Juergen Fitschen, Co-CEOs of Deutsche Bank AG address the bank's annual news conference in Frankfurt, January 29, 2014. 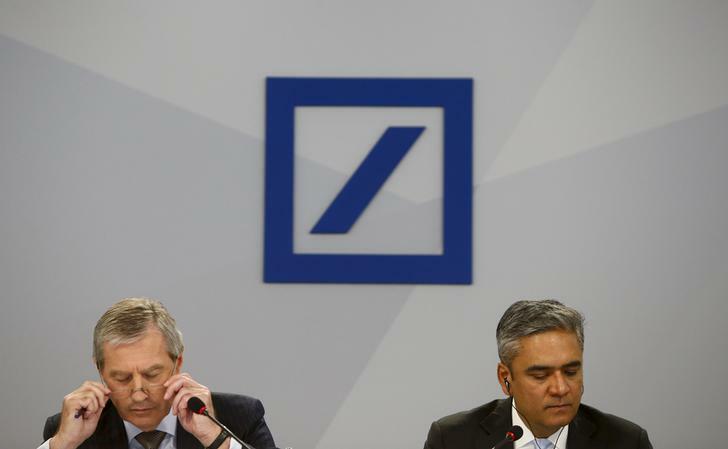 Deutsche Bank on May 18 announced a plan to raise 8 billion euros ($11 billion) of fresh equity, as it moved to answer investor and analyst criticism that Germany’s largest lender remained undercapitalised. The capital increase will consist of a placing of new shares with Paramount Holding Services, an investment vehicle of Qatar’s Sheikh Hamad Bin Jassim Bin Jabor Al-Thani, to raise 1.75 billion euros. The bank will also raise 6.3 billion euros from a fully underwritten rights issue. The injection by Paramount Holding Services is to be priced at 29.20 euros per share, a 5 percent discount to Deutsche’s previous closing price on May 16. Following the capital hike, Deutsche will have a fully-loaded Basel III common equity Tier 1 ratio of 11.8 percent, up from 9.5 percent at the end of March. Deutsche also said that it was delaying or scaling back mid-term targets. The bank now hopes to reach a 12 percent return on equity by 2016, a year later than originally envisaged. An aspiration to reduce the group’s cost-to-income ratio to 65 percent has also been postponed by a year to 2016. Meanwhile, Deutsche said its investment bank was now only targeting a return on equity of 13 percent to 15 percent by 2015, rather than an excess of 15 percent. Its global transaction banking business is only expected to make between 1.6 billion euros and 1.8 billion euros by 2015, not the 2.4 billion euros previously targeted. And its private client business is now expected to make between 2.5 billion euros and 3 billion euros by 2015, rather than 3 billion euros or more.